A migratory bird has caused alarm in a village in south-eastern Turkey after locals mistook it for an Israeli spy. Villagers' suspicions were aroused when the bird, a common European bee-eater, was found dead in a field with a metal ring around its leg stamped "Israel". They called the police after deciding its nostrils were unusually large and may have carried a microchip fitted by Israeli intelligence for spying. It was taken to government experts for examination and declared safe. The BBC's Jonathan Head, in Istanbul, says the regional office of the Turkish agriculture ministry examined the colourfully plumed corpse and assured residents of the village, near the city of Gaziantep, that it was common practice to fit a ring to migratory birds in order to track their movements. 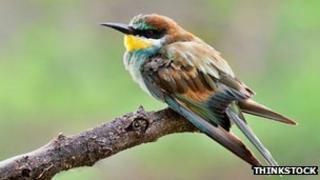 An official at the ministry told the BBC that it took some effort to persuade local police that the little bee-eater posed no threat to national security. At one point a counterterrorism unit became involved in the case. Our correspondent says that wildly implausible conspiracy theories take root easily in Turkey, with alleged Israeli plots among the most widely believed. Ties between Turkey and Israel deteriorated sharply after nine Turkish pro-Palestinian Islamic activists died in a raid by Israeli security forces on a boat trying to break the blockade on Gaza two years ago.